Seasonal times Festival and Christmas: open until 3am. Eccentric interiors, cheap booze, a mid-week pub quiz and weekend DJs bring a loyal student clientele to Pilgrim. A VIP discount card for regulars draws the crowds to Pilgrim for quizzes, DJs and pre-club party nights. 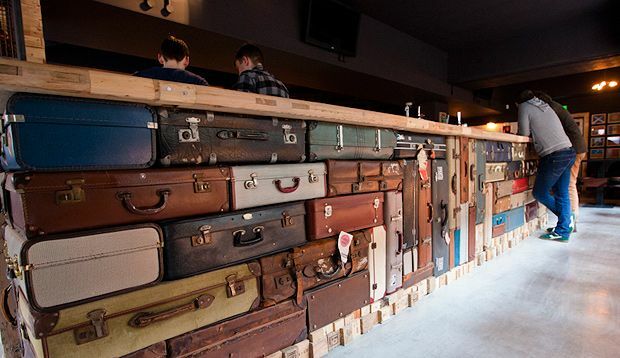 The main focus is on what lies behind the bar of stacked suitcases: beers, bombs, shots and pitchers are popular in a place where alcopops clink with local beers and enjoy spending the night together. The core menu of burgers, nachos, dogs and fries will expand in spring 2018 to include student-pleasing staples like munchie boxes, as well as a hot sauce challenge. Booze and bravado aside, Linda McCartney may have enjoyed the fact that her veggie burgers are served in a pub featuring mostly recycled furniture and décor, including 1930's theatre seats and sofas covered in old denim. Welcome to the Capital’s first licensed premises specifically designed to create as small a carbon footprint as possible. From the floor screed, reconstituted from the cement of demolished buildings, to the bar made with hundreds of discarded suitcases, or the walls clad from reclaimed pallets to the original 1930s cinema seating – nearly 98% of the environment at Pilgrim has been salvaged, recycled or upcycled. Special care has been taken in creating a menu which not only represents good quality but good value too. The food prepared is wholesome, the drinks served are refreshing. Every product is on the menu for a reason – there are no politics behind the decision to stock anything nor is there any pretense. We stock it because we like it and we hope you like it too. Major sporting occasions available across eight screens – including every game of the forthcoming six nations. Large selection of craft beer, wine and cocktails. Live music on Sundays from 7pm. Live entertainment: Wed live music, Tue pub quiz, weekend DJs. Capacity: 212 standing, 90 seated.